The U.S. House Natural Resources Committee this week passed a bill that would require congressional authorization for any structural modification or action at Columbia/Snake river federal dams that would restrict power generation or navigation. "No structural modification, action, study, or engineering plan that restricts electrical generation at any FCRPS (Federal Columbia River Power System) hydroelectric dam or that limits navigation on the Snake River in Washington, Oregon, or Idaho shall proceed unless such proposal is specifically and expressly authorized by an Act of Congress," says a summary of H.R. 3144. The bill also requires the Bureau of Reclamation, the Bonneville Power Administration, and the U.S. Army Corps of Engineers to operate the FCRPS in a manner consistent with the 2014 biological opinion for Columbia/Snake river salmon and steelhead "until the later of: (1) September 30, 2022; or (2) the date upon which a subsequent final biological opinion for the FCRPS operations is issued (after completion of the final environmental impact statement on a record of decision for a new operations plan for the FCRPS) and is in effect, with no pending further judicial review." The bill says the agencies may amend portions of the biological opinion "and operate the FCRPS in accordance with such amendments, before such date if all of the entities determine that: (1) the amendments are necessary for public safety or transmission and grid reliability; or (2) the actions, operations, or other requirements that the amendments would remove are no longer warranted." The bill is sponsored by Rep. Cathy McMorris Rodgers, R-WA. Co-sponsors are Reps. Jaime Herrea Butler, R-WA, Dan Newhouse, R-WA, Greg Walden, R-OR, Kurt Schrader, D-OR, Mark Amodei, R-NV, Raul Labrador, R-ID, Greg Gianforte, R-MT, Paul Gosar, R-AZ. A McMorris Rodgers press release says, "With a commitment from the Speaker of the House, this legislation will now go to the floor of the House of Representatives for a full vote in the coming weeks." In testimony at a hearing on the bill last year, a representative of the Bureau of Reclamation said, "In our view, H.R. 3144 aims to allow NOAA Fisheries and the federal agencies responsible for System operations to focus on development of a long-term biological opinion and EIS without diverting resources for preparation of a short term biological opinion to cover the period of 2019- 2022. We believe H.R. 3144 also aims to reduce litigation over System operations during that period. The Department welcomes the opportunity to assist the bill sponsors and this Committee to ensure H.R. 3144 accomplishes our shared interest in providing continued stable operation of the System. "Section 2 requires the Secretaries of the Interior, Energy and Army to continue operating the System in compliance with the 2014 BiOp. The Secretaries would continue System operations under the 2014 BiOp until either September 30, 2022, or the date upon which a final biological opinion is in full force and effect, whichever date is later. It is our understanding that the sponsors' intent in Section 2 is to authorize continued system operations under the 2014 BiOp, thus alleviating NOAA Fisheries' obligation to complete the 2018 BiOp and the other agencies' corresponding need to produce a biological assessment. This would allow federal agencies to focus their resources on developing a long-term BiOp." By court order, federal agencies are currently working to complete a new BiOp by 2018. "Hydropower helped build the Northwest, and still today it offers us clean, renewable, reliable, and affordable energy to help power our homes, businesses, and communities," said sponsor McMorris Rodgers. "I'm proud to see this bipartisan legislation pass the House Natural Resources Committee today and look forward to it coming before the full House in the coming weeks. My goal is to ensure that dams and fish can co-exist, and this Biological Opinion provides a collaborative approach so we can continue to improve technology and fish recovery efforts, while supporting the clean energy produced on our dams. I'm proud to lead this effort along with the support of organizations and people all across Eastern Washington." "Without Snake and Columbia river dams and the many benefits they provide, life in Central Washington as we know it would be unrecognizable," said co-sponsor Newhouse. "I represent communities that actually live with the consequences of forced increased spill or potentially breaching dams, whether through higher electricity rates, higher transportation costs, reduced access to irrigation water, reduced flood control, and more. I appreciate the support from colleagues on both sides of the aisle for this bipartisan legislation to preserve the benefits of dams that communities in Central Washington depend on. We need to safeguard our dams while continuing to invest in fish recovery efforts because the cost of the alternative is too high for rural communities. I am grateful to Chairman Bishop for his support in committee as this legislation moves forward." "This is a bipartisan bill with broad local support from citizens in the Pacific Northwest. It removes unnecessary federal barriers to water and power resources while protecting the environment, and I thank Rep. McMorris Rodgers and her colleagues from the region for their ongoing work to move this bill forward," House Natural Resources Committee Chairman Rob Bishop, R-Utah, said. "I write to express my deep concerns with HR 3144, legislation which would freeze in place a 2014 biological opinion (BiOp), or salmon management plan, for the dams composing the Federal Columbia River Power System. While the State of Washington believes the 2014 BiOp represented a step forward for efforts to protect and recover 13 stocks of threatened or endangered Columbia and Snake river salmon and steelhead, HR 3144 would thwart constructive ongoing efforts to improve future salmon and dam management. This would not only hurt salmon but also the recreational and commercial fisheries, tribes, and other species (such as Puget Sound's southern resident killer whales) that benefit from healthy salmon runs. "I am committed to preserving the benefits of our hydropower dams in a manner that is in balance with protecting and restoring salmon. While our dams and dam operations have been modified to reduce their impact to salmon and steelhead over the last 20 years, there is evidence that salmon may further benefit from additional modifications to dam operations that would help restore salmon populations. "The State of Washington is participating in productive regional discussions about the best way to test the potential benefits of additional "spill," in 2018 and potentially beyond. This discussion and learning opportunity would be blocked by HR 3144's prohibition on any studies or actions that restrict electricity generation at any dams in the Federal Columbia River Power System, even by a small amount. 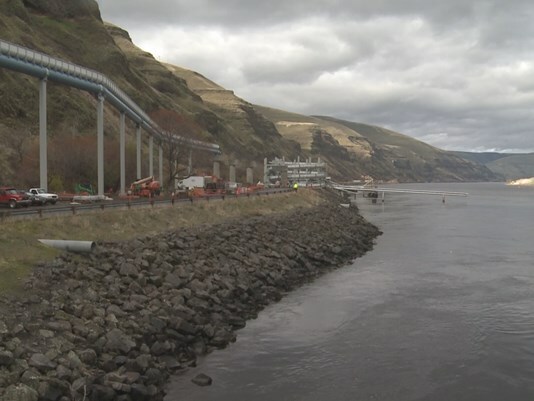 "Similarly, several Washington State agencies are engaged as cooperating agencies in the Columbia Snake River Operations study process currently being conducted, pursuant to the National Environmental Policy Act (NEPA). This process promises to provide valuable information on a range of potential future dam operations and salmon management strategies. "As with the discussion regarding increased spill over the dams, HR 3144 would halt this learning process in its tracks, preventing a constructive dialog among federal and state agencies, tribes, and the public about how best to manage Columbia and Snake river dams in a region that must continually adapt to ongoing changes to its climate, salmon habitat, and energy system." NOAA Fisheries' biological opinion, or "BiOp," sets "reasonable and prudent alternatives" intended to mitigate for impacts of the federal dams on 13 species of Columbia River basin salmon and steelhead listed as threatened or endangered under the federal Endangered Species Act. Subsequent recovery plans for each listed species outlines the standards for recovery and the actions required to meet them. A federal court has set a schedule for federal agencies to replace the 2014 salmon/steelhead BiOp. The agencies charged with the NEPA process -- Corps, Bureau and BPA -- said the process would require five years of public involvement and work, but along the way it would meet the prior schedule for a 2018 BiOp, complete the EIS in 2020 and submit a new BiOp to the Court in 2021.